Which one is more powerful or dangerous? OPINION — Well, it didn’t take long for the Democrats, in their new congressional majority, to introduce a ‘fresh’ gun control bill. Known as the ‘Feinstein Assault Weapon Ban of 2019,’ the new bill is obviously a valiant effort to protect the American people by banning SOME of the weapons used in 2% of the homicides in the country. None of the guns banned are actually assault weapons, but the people behind the legislation like the term. Banning hammers would save more lives, if saving lives were a concern. It would also be better for my left thumb. To be honest I’m tired of writing about gun control, gun rights, gun wrongs, gun bills, and gun bobs. It’s the same old thing, over and over, and no one seems to be listening anyway. It’s like trying to explain the federal tax code to a bunch of kindergarteners. They’ll stare at you, vacantly, pretending to listen, but all they really want to do is drink their juice. Congress is no different, except for having shorter attention spans. Above: Which one is more powerful? But in the interest of whoever is interested, it’s probably a good idea to lay out the basic tenets of the new bill, which are somewhat interesting in their lack of novelty. The bill will not pass, of course. The house will pass it, but the senate will not, and even if they do, Trump will Trump it, because it’s a bad bill, and everybody knows it. As mentioned previously, no actual assault weapons would be banned by the bill, since there is no such thing as an assault weapon. Assault is a verb. 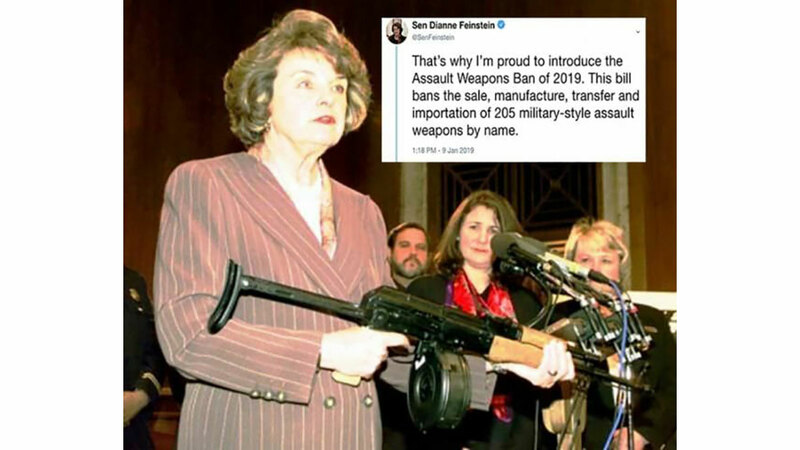 But Feinstein and her cronies have redefined the term ‘assault weapon’ to mean ‘scary black rifle.’ And black rifles matter very much to the Dems. The new AWB of 2019 is basically a refried version of the AWB of 1994, which was officially the ‘Public Safety and Recreational Firearms Protection Act,’ which makes it sound like it was written to protect firearms. Not so much. But the new one has some different bells and whistles. It’s the legislative equivalent of a 1964 Dodge Dart with a new coat of paint. A rattle can job. 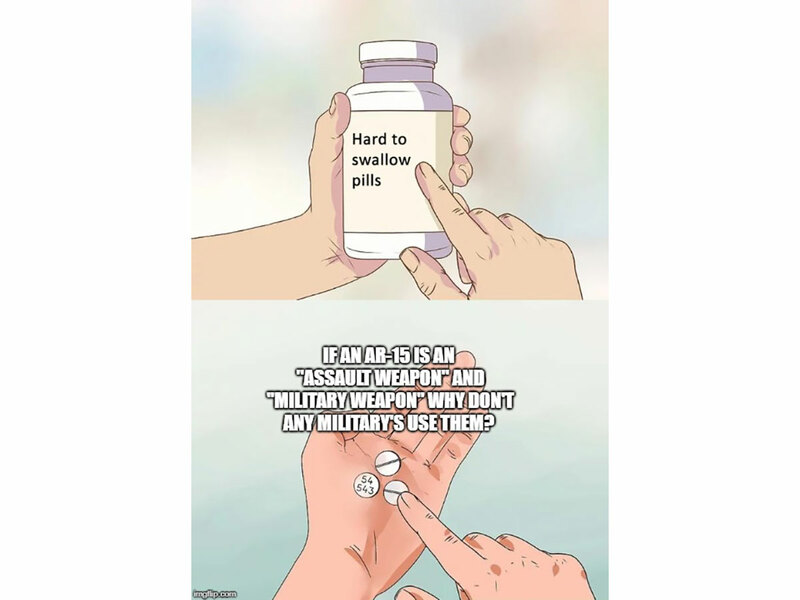 Like the old AWB, the new one would ban ‘military-style’ firearms with certain features, such as pistol grips, barrel shrouds, and bayonet lugs. Lots of drive-by bayonettings going on in the cities, I reckon. None of the features make the guns any more dangerous, the Dems just don’t like them. So there. Magazine that hold more than ten rounds would also be banned, along with collapsible stocks, and while the mags would be grandfathered along with the rifles, it’s not clear whether the stocks would be. The Dems are a little vague on some of the details. I imagine it’s hard to think straight when you’re fidgeting from one foot to the other in delight. The bill would also ban bump stocks, which is kind of interesting, since they’ve already been banned. Makes you wonder if the Dems have any real knowledge of what laws are already on the books. Maybe bump stocks are so evil they need to be banned twice. Sort of a ban ban. Or something. The guns banned will evidently have to have two or more of the evil features to be outlawed, besides the 205 firearms listed by name. 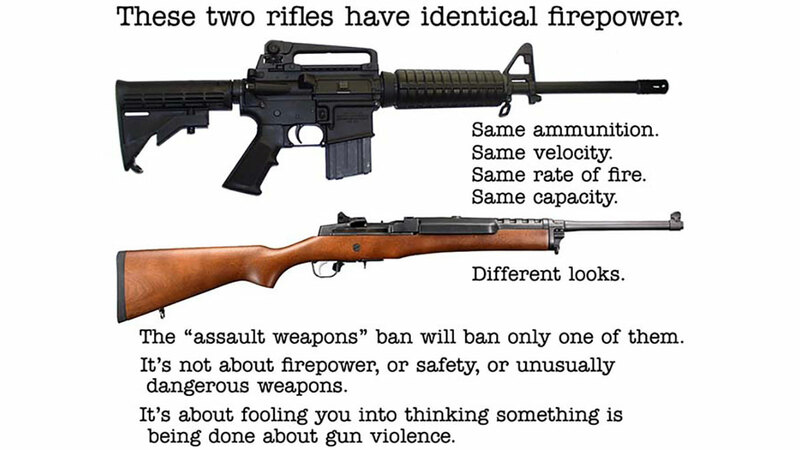 Other rifles banned would be those that use a detachable magazine AND any one of the other nefarious attributes, such as collapsible stock, pistol grip, foregrip, barrel shroud, or threaded barrel. Pistols that weigh more than 50 ounces are also declared wicked, and pistol stabilizing braces would be out. Accuracy is evidently a Romper Room no-no. Also banned would be ‘stocks designed to comply with the law.’ So if someone invents a stock that doesn’t meet the exact criteria listed, so it’s actually legal, it’s still illegal. They’re saying ‘A is bad, so you can’t have A. And if you figure out a way to design A so it’s actually B, it’s still A, so you still can’t have B, either.’ They’re mean, those Dems, but they ain’t stupid. The most perplexing aspect of the new AWB is the grandfather clause, which means anyone who owns these guns, with these features, prior to the day the ban goes into effect can keep them. The rifles the bill is aimed at are the most popular long guns in the country. There are more than 300 million of them in circulation now. It’s not like someone intent on doing harm wouldn’t be able to get hold of one. The universal background check rule is also in the ban, but that only applies to people who obey laws, so criminals would still be able to get whatever they want, like they do now. After all, they’re criminals. It’s interesting that the Bureau of Justice Statistics, which is part of the DOJ, just released a study after interviewing many thousands of criminals in prisons. It says that ten percent of bad guys who used guns in crimes bought them at a retail outlet. Which proves that background checks are worthless for preventing crime. They do, however, make liberals feel good, so there’s that. Gun sales have been dropping off the past couple of years, but this bill will change that. Nothing impels people to want something like telling them they can’t have it. This new bill will boost gun sales like nothing else could, so I’m thinking the gun manufacturers should write a huge thank you note to the Dems in congress.